Heritage The Villas offers a variety of self-contained villas that are surrounded by lush, emerald green gardens to create a perfect tropical haven for your guests and yourself. An extremely stylish complex, this group of villas houses Heritage The Villas 2, an exceptionally luxurious villa which is designed for your comfort. This villa boasts two beautifully furnished bedrooms that overlook the garden. 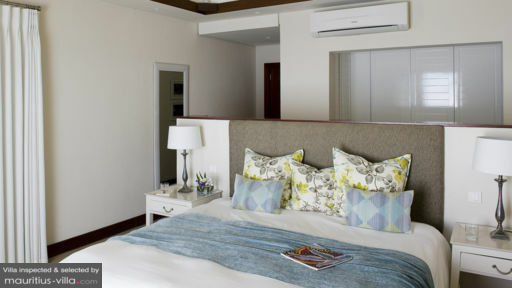 In the master bedroom, guests will find a king-sized bed that promises a delightfully restful slumber after a full day of exploring Mauritius. The bedrooms are perfectly air-conditioned, sheltering you from the tropical heat. Guests can also make full use of an elegant en-suite master bathroom, complete with shower, tub and dual sink. Additionally, the bedroom also comes with a flat-screen television, complete with a full entertainment system. Wooden shutters only serve to complete the rustic and extremely elegant feel of the place. In this villa, there’s also a guest bedroom that can comfortably accommodate up to two guests. In this villa, you’ll find a large outdoors infinity pool which you can dip into after a full day of exploring the many wonders that Mauritius have to offer. Entirely private, the pool is set in a tropical garden, where you can also lounge on the sun bed with your favorite drink and book. Because it is so spacious and perfectly manicured, the generous green space outside your villa can also be used for delectable barbecue parties with your friends and family. At Heritage The Villas 2, you will be able to enjoy spacious and airy living spaces that echo the complex’s warm and homely atmosphere. The generously-sized living room overlooks the garden and opens into the dining room which can seat up to four people. If you feel like staying in, you can just put your feet up and enjoy a nice movie in front of your flat-screen television in the living room. In the villa, you’ll also find a spacious kitchen which is equipped with just about anything you will require to comfortably prepare your meals. Indeed, guests of the villa can make full use of the various utensils, coffee maker, microwave, gas stove, oven, dishwasher and the likes. One of the best things about staying at Heritage The Villas 2 is that guests will be able to completely relax and enjoy their vacation without having to worry about tedious housework since the villa offer luxury-in house services to enhance your rest. Indeed, you’ll be able to enjoy the services of a housekeeper. 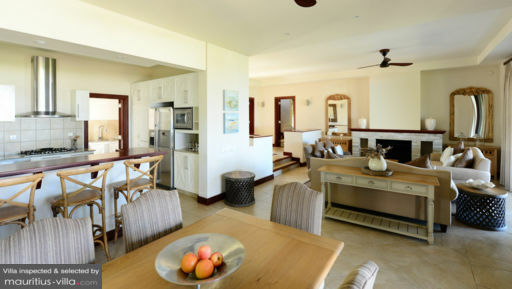 For an added fee, you can also hire a chef who will come by to whip up your favorite meals right in the villa. Other paid services include in-house massage, personal butler and chauffeur. Heritage The Villas 2 is found in the scenic village of Bel Ombre, in the south of Mauritius. This sunny village comes with various types of supermarkets and local shops where you can browse for groceries. In the complex, you will also find an array of French, Japanese, Indian and Mauritian restaurants. As a guest of Heritage The Villa, you can also benefit from exclusive access to the nearby Club House, Annabella’s, C Beach Club and Golf Course.